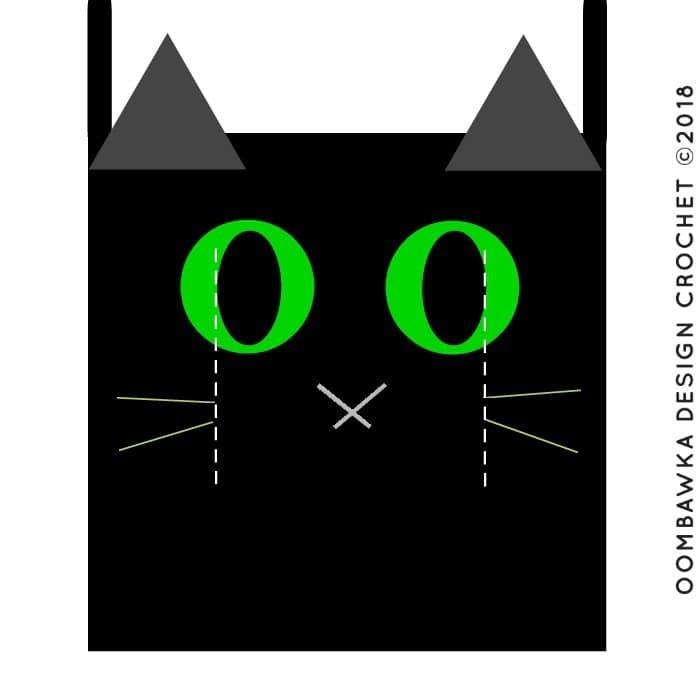 You are here: Home / Free Crochet Patterns / My Free Patterns / Free Crochet Patterns for Halloween / Crochet the Black Cat Halloween Trick-or-Treat Bag Pattern! It’s time for the next free pattern in our Halloween CAL! 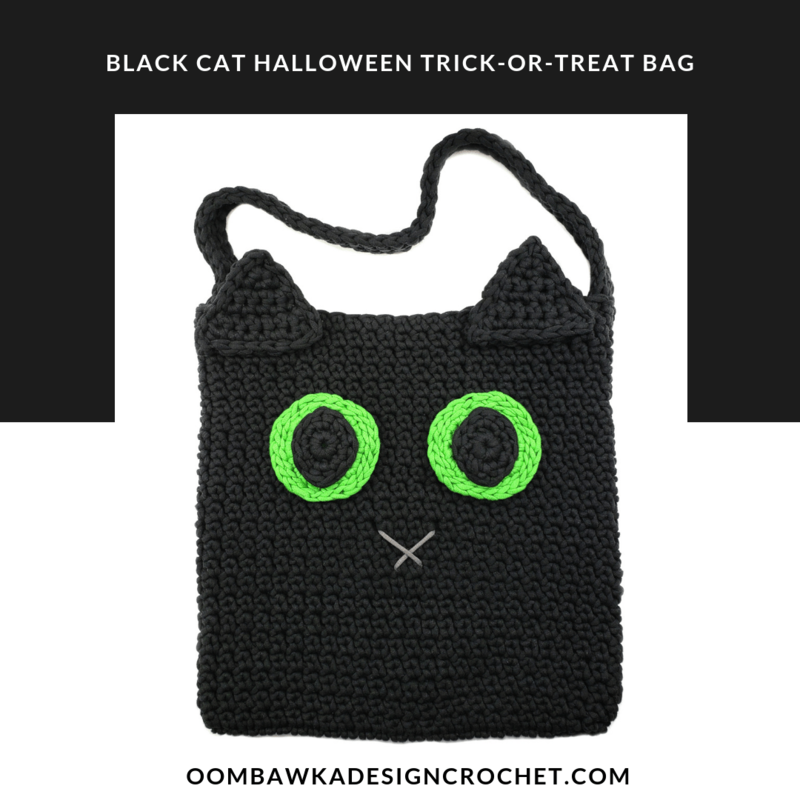 Introducing the Black Cat Halloween Trick-or-Treat Bag Pattern! Add this to your Ravelry Queue and Favorites here! This post includes affiliate links. If you make a purchase after clicking on an affiliate link, I may receive a small commission for the referral at no additional expense to you. 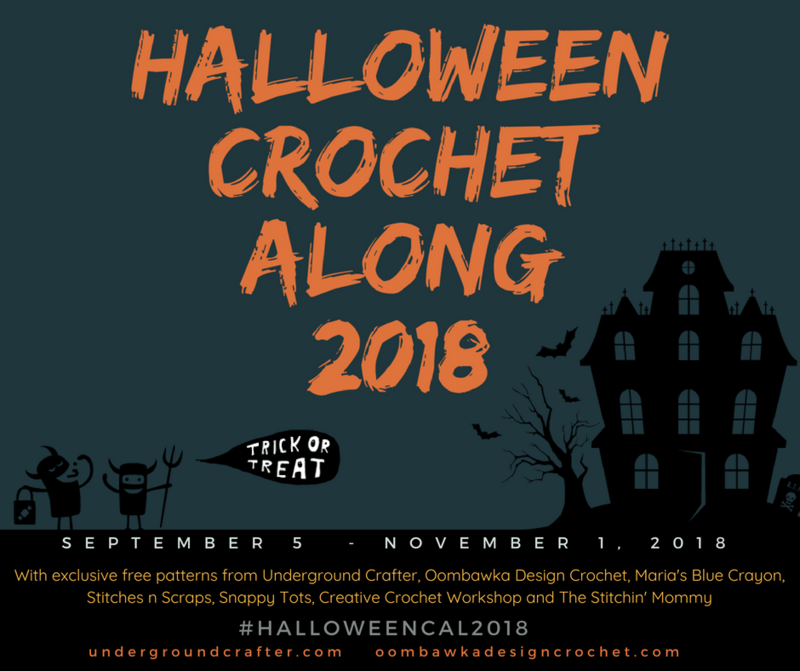 Join our Spooktacular Halloween Crochet Along! By the end of this CAL you have the chance to make 7 Halloween themed crochet projects. Each design is an exclusive to this CAL, brand-new pattern and each project you crochet can be used as an entry to our end-of-cal giveaway! You can join the Crochet With Us and Underground Crafters Facebook groups, or visit this thread in the Underground Crafter Ravelry group to chat about your WIPs and ask questions. Pop by Marie’s intro post >HERE< to find out all the details and to learn how to submit your image to enter our end-of-cal giveaway! Hook: 7 mm (L) Lemon Candy Shop Crochet Hook. I used this hook. Insert your hook into the specified stitch or space, yarn over and pull up 1 loop (2 loops on the hook). Yarn over and pull through one loop (2 loops on the hook). Yarn over and pull through the remaining 2 loops. Use a stitch marker to mark your place. Do not slip stitch to join or chain additional stitches unless the instructions indicate to do so. The bag is worked in continuous rounds (grab your stitch marker!) in black. The strap is worked in continuous rounds (grab your stitch marker!) in black. The ears are worked back-and-forth in rows. The ears are crocheted in black. Make 2 OR make 4 if you want thicker ears. I made 4 of these triangles for the ears for the sample bag. I put 2 triangles together and slip stitched around the outside edges to form each ear. I wanted the ears to stand-out and to stay straight up on the bag. You can use 1 triangle on each side instead. It will work but the ears may fold over a bit over time. 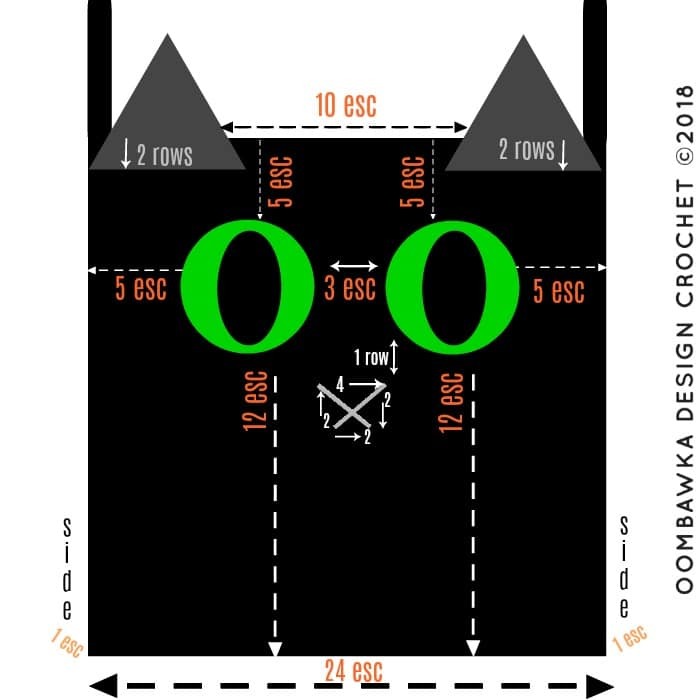 R6: 1 sc in each st across, finish off and weave in ends OR if you are only working one triangle for each ear, ch-1 at the corner and then rotate your work to begin slip stitching around the outside of the ear. Slip stitch around the outside of the ears, working under one loop of each edge stitch around. Ch 1 at the corner before rotating and working down the other side edge. Once you have gone all the way around the ear, sl st to the first sl st to join and finish off. Weave in any remaining ends. I have created a video to show you how I do this working with the 2 layers (2 ears) and the process is the same for slip stitching around one triangle (except there is only one layer instead of two). The eyes are worked in continuous rounds (grab your stitch marker). The eyes are crocheted in green. Yellow would also work well. The pupils are worked in a round. The pupils are crocheted in black. I thought it would be easiest to show you this as a diagram. This is how I placed my pieces. I hand sewed them with the yarn tails and same color yarns as the pieces. The strap was sewn on the side edge esc stitch. It overlapped slightly on both sides to the front and back esc stitches. The strap was sewn inside the bag using a whipstitch. 1-inch of the strap was sewn into the bag on each edge. The nose is hand sewn using a yarn needle and a contrasting color of Bernat Maker Home Dec Yarn. The nose for the sample project was crocheted in gray. If you would like to add whiskers for your cat, here is a diagram with placement suggestions. I would hand sew them in the same color as the nose, or the eyes! When you do sew them on be sure you don’t pull too tightly on the back side because it will pucker the fabric of the bag.